Canadians are a hardy breed. 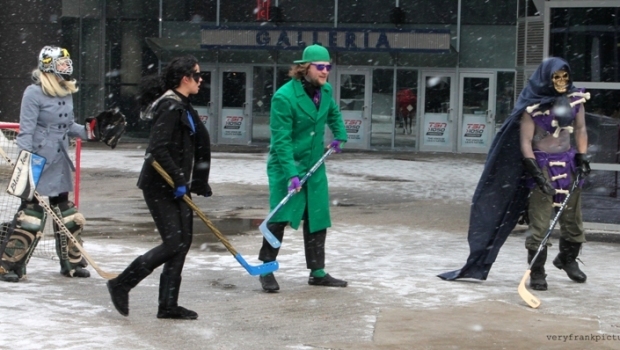 The fact that North America was gripped for the first two months of the year in colder-than-even-Canada-is-used-to frigid temperatures didn’t dissuade the Southern Ontario cosplay community from showing off their star quality at multiple conventions or, as the photographic evidence below proves, braving the elements to play hockey. As photographic evidence below proves, well, let’s say it’s not everyday that you see Loki, Riddler and the Joker all playing street hockey! Photos taken at KW Tri-Con, FrostCon, The Cosplay Cup – Hockey Edition, and Kitchener Comic Con. All photos by Greg Payne/Very Frank Pictures.